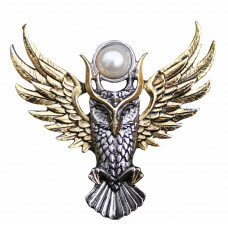 Order the Owl of Athena for Magickal Wisdom Brooch by Briar from Unicorn Design. The Owl of Athena for Magickal Wisdom brooch is designed by fantasy artist Briar, and it is part of the jewelry series Bestiary by Briar. The owl is sacred to Athena, Goddess of Wisdom and Warfare in ancient Greek mythology and offers guidance through the dark Underworld. This Bestiary Brooch is made of silvery zinc alloy and accented with a white manmade pearl. The brooch comes with a satin pouch, with the brooch's meaning explained on an enclosed card. Approximate size: 48 mm wide and 48 mm high. Originating in the ancient world, Bestiaries were made popular in the Middle Ages. Illustrated volumes described various real, or imaginary, animals, often having symbolic significance and accompanied by a moral lesson.